The best way to fight Evil is with Good... and the best way to defeat Darkness is with Light. 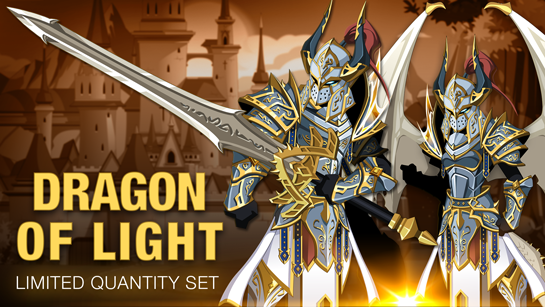 Starting this Friday, June 29th, at 6 PM EST, find the Dragon of Light limited quantity armor set on our Limited Quantity Setpage Each package also comes with a unique badge in your Book of Lore and on your character page! 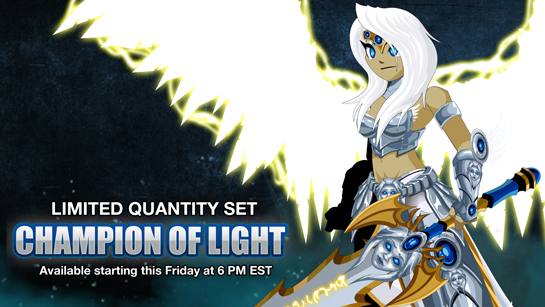 The Dragon of Light limited quantity set can only be purchased directly through the lqs.aq.com site starting this Friday at 6 PM EST. The June 2018 Limited Quantity sets are listed below. Each set has a chance to return in future limited quantity set releases until their quantities sell out. Once the quantity hits 0, they will never return again! Package quantities restock throughout the weekend to give everyone a chance to get the gear they want, no matter what timezone or country they live in. We received a lot of feedback from the community after last month's Limited Quantity Set series, and this Friday's LQS incorporates much of it. Thank you to everyone who shared their thoughts! During our last Limited Quantity Set series, we tested a new approach to offering our member and free-player gold sets: selling "advance chance tickets" (essentially, raffle tickets bought with in-game currency) for certain item sets in a prize pool. Our goal was to reduce the chance that you'd miss a set you wanted because of website or scheduling issues, and to minimize the impact to our website and game servers (from so many people flooding onto them to be the first to get their set). That was a success, and I appreciate everyone who participated in the test! PS - if you have Sepulchure's Undead Blade, make sure to log in this weekend! You can battle the release boss for a chance to get Doom Dye or Monstrous Dye to change the look of your weapon.